So, the last BLDSA swim of the season, Lynn Regis, is complete and swim event appearances as BLDSA President have drawn to a close for 2017. Everyone has got home safe n' well and everything else is merely a bonus, if truth be told. It's hard to believe that one can take up this sport in 2010 (barely being able to swim a mile) then emerge 7 years later as president of the nation's most decorated & prestigous long distance swimming club, the BLDSA. 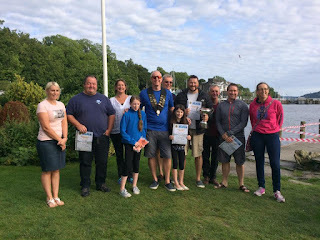 The Association would not be run without the dedication of volunteers and it seemed fitting to do one's duty after 4 years on the committee and the whole swim series under one's budgies. The summer has been a delicate balancing act of juggling 60 hour weeks in the city; becoming an expert on the country's transport network; organising 2 major swims; and meeting loads of new & old inspirational people with the backdrop of some of the most stunning locations the country has to offer. 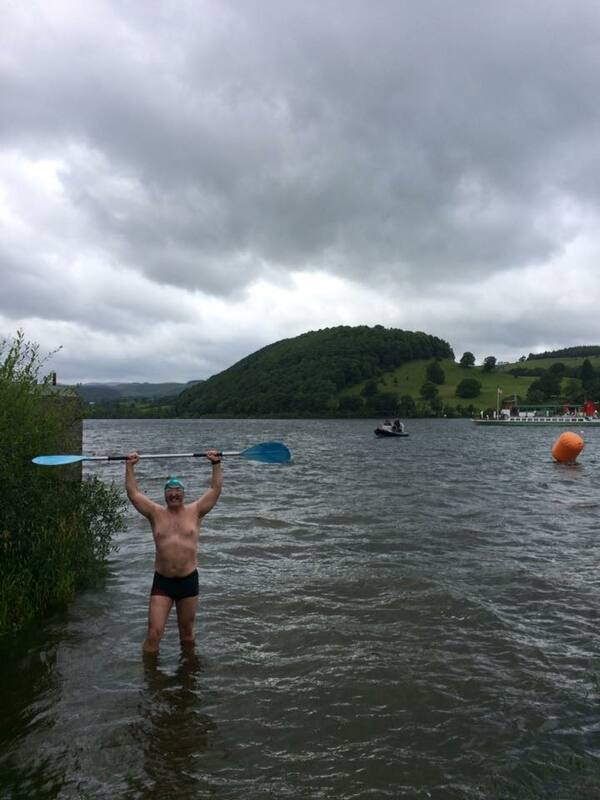 The first port of call for the Presidential year was actually abroad in a swim capacity taking on the SCAR swim in Arizona for the second time after a 1 year break. Pete Fellows was kind enough to donate his time and kayak expertise again as we reunited for the 5000 mile trip stateside. Race Director, Kent Nicholas, RT and the crew run an amazing event of 42-ish miles over 4 days at the end of April and that swim is highly recommended for getting in early-season miles in possibly one of the most beautiful and warmest landscapes on earth. The application process starts in November and sells out in minutes. It's fair to say that Arizona has become almost a second home for me now and it was great to have that 'selfish' release before the season started properly. It was a new experience (to say the least) finishing the C (2nd SCAR swim) at Canyon Lake where a rattlesnake had been swimming only 10 mins previously! 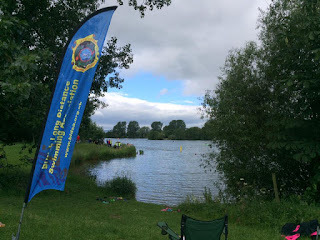 Back in Blighty, the first swim of the season saw a decent contingent of swimmers from far and wide congregate in Nottingham for the annual Colwick Park swim on 21st May. 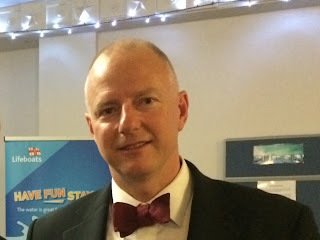 It became apparent very quickly to the safety officer on the day, Richard Hardy, that after taking out the boat for an initial circumnavigation, a thick layer of blue-green algae was seen across the entire 1km course and it was going to be absolutely unavoidable (and potentially very dangerous to all participants). Concurrently, the officials received accounts of how 3 swimmers had been ill during the week, so the difficult decision was made to abandon the event before swimmers had been given a chance to get their budgie smugglers & cossies wet! Safety first. This decision was not taken lightly, however, in hindsight, absolutely the right decision was made and all swimmers received a full refund including Entry Central fees. Next up on 4th and 5th June was the annual Wykeham weekend, superbly organised & marshalled by Liane Llewellyn-Hickling with all the help from her family and friends. 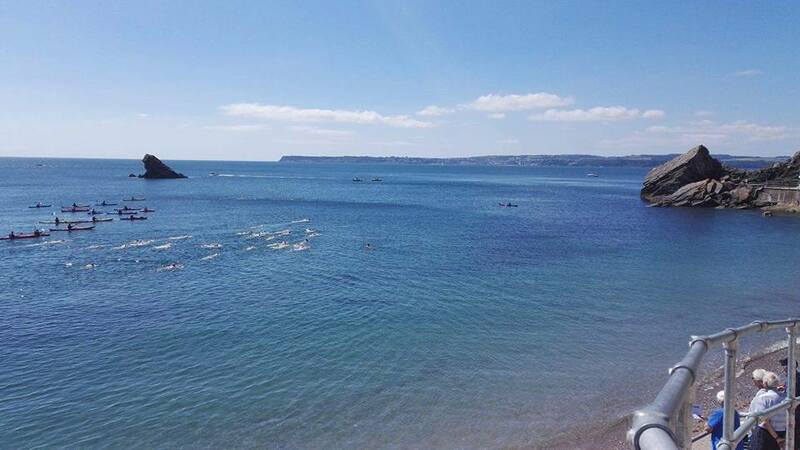 The swim offers a night-swim (5km on the Saturday) washed down with 5km, 2km and 1km events on the Sunday. Needless to say the event ran as smoothly as ever. Phil Yorke kindly stepped in as President-elect to hand out prizes/certificates as I was rushed stateside again sadly for my father-in-law's funeral in St Simon's Island, Georgia. Liane has been running this swim now for 19 years and steps down as Race Director this year. Million thanks Liane from all of us at the BLDSA for your (and your family's) selfless service to the Association. The organisation and planning for the Champion of Champions this year made the D-Day landings look like a spur-of-the-moment decision.... In March, we were told that we wouldn't be allowed to use Dover Harbour for the annual 9-miler (despite having 65 sign-ups and 20 on the waiting list) due to pile driving for a new marina which would potentially damage the swimmers' hearing. 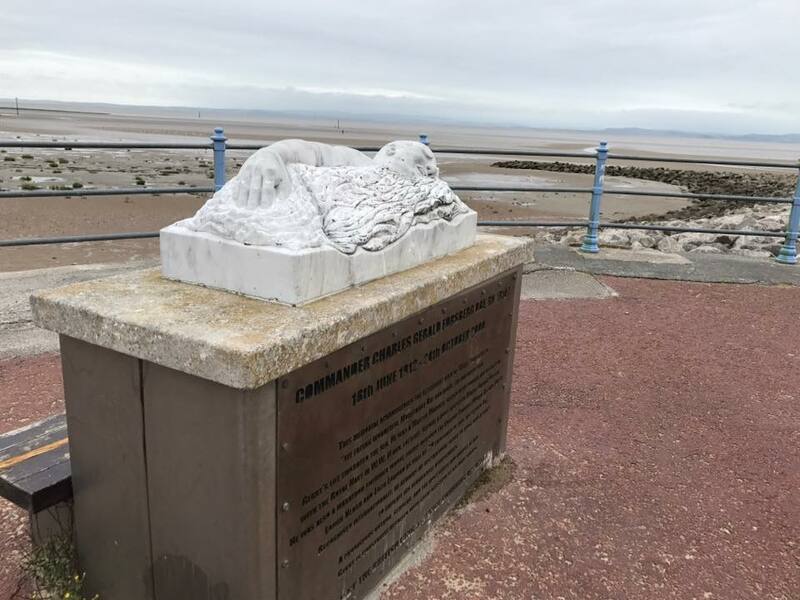 However, after consulting extensively with Mike Oram (President of the CSPF and experienced pilot), Jane Bell and I managed to find an alternative site in Ramsgate with the help of Mandi Bodemeaid. Our application to Ramsgate was within 13 weeks of the swim but unfortunately we had missed their deadline by one week (wasn't like the pope was coming! ); thus we pleaded with Dover to re-accommodate us. They relented and agreed but couldn't guarantee a start time! It is impossible to describe how un-nerving it is to organise a swim not knowing start times OR length of event. As usual we muddled on! In the end, swimmers & volunteers enjoyed one of the finest weather days Dover has ever seen and even an accident in the Folkestone Tunnel blocking most of our kayaker volunteers for over an hour wasn't going to spoil what was, in the end, an amazing day. Once we got the green light, a 10km event with 5km, 3km and 2km events were then swiftly implemented. For someone who really appreciates observing the dark art of front crawl, we were treated to a masterclass with James Leitch (all the way from Glasgow) and Ollie Wilkinson (all the way from Cheltenham) go at it 'hammer-and-tongs' until James emerged as victor by only a couple of minutes. Val Smith showed great tenacity and stubbornness to complete the event with only 5 mins of allotted total time to spare before the cut-off. It was lovely to meet so many new faces this year, along with the more familiar faces of the Red Top and Nutters contingents. Thank you to all swimmers for being so understanding and I look forward to directing an easier race to organise next year! One week later, it was up to Ellerton Lake near Richmond in North Yorkshire. 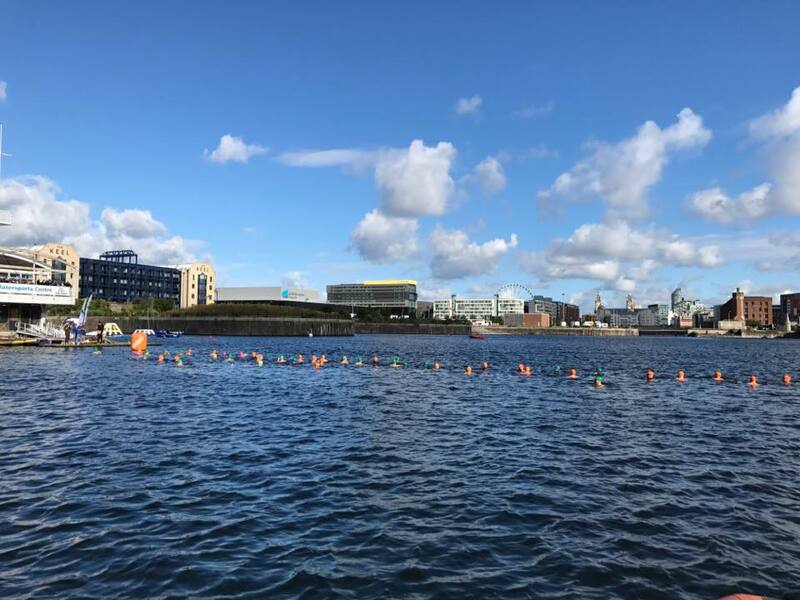 Amanda Bell has pioneered a new swim for the BLDSA mirroring the meteoric success of the Champion of Champions (South) format but on the doorstep of our Northern members. Amanda is one of the most charismatic people I know and was able to deploy one of the most enthusiastic gangs of volunteers ever seen at a BLDSA swim. Again it was ace to see so many new faces and the Association is very thankful for this awesome new event. It was very well attended, with very few places spare given no kayaker is required. Liane Bentley and James Leitch dominated the Ladies and Gents 9-Mile event with a young Ellie Knight becoming one of the only juniors in recent years to complete a Champion of Champions event in its entirety. Great swim, Ellie and very much one to watch for the future! Swimmers enjoyed the pure 20c water. Behind the scenes, one of the rescue boats broke the axle of the trailer on the motorway on the Friday (thank god no-one was injured) meaning Mick Blackburn & Martyn Coates dropped everything to repair the axle on the Sunday in time for the long journey to Torbay the following weekend. Oh boy, there's just so much going on behind the scenes to make this all happen! 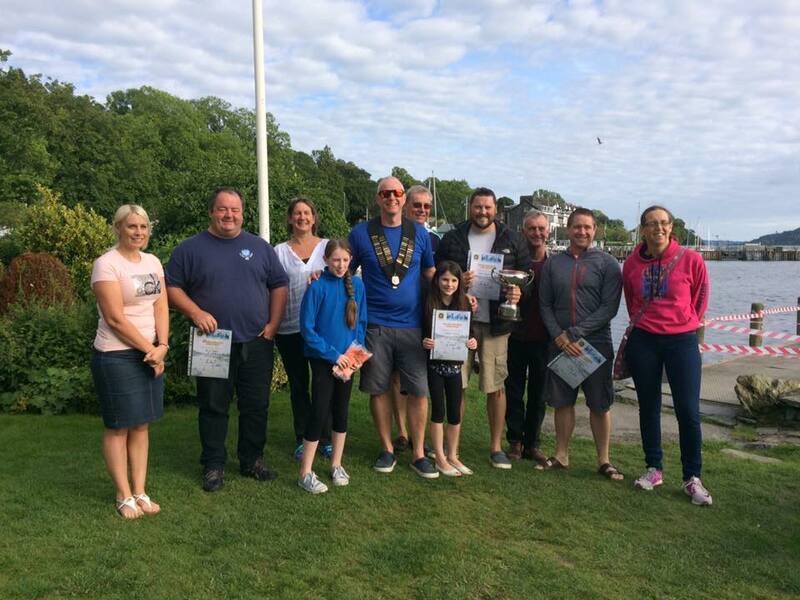 Andre Roberts stepped up to give back to the sport & the Association by running a sold-out Torbay swim this year. Again, the weather gods smiled upon us and the full experience of the event was shared thousands of times over social media thanks to incredible footage taken by a drone from a very experienced media friend of his. How innovative! The water was a refreshing 14.9c and very welcome given the blazing sun. 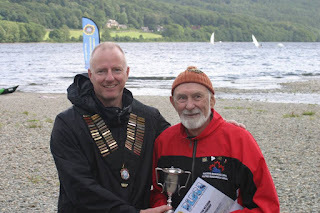 The President was treated to kayaker legend Mike Roberts leading him to the first of his PBs of the season but the swimmer made the schoolboy error of forgetting to put sun cream on backs of legs and thus spent the next week regretting it massively (hardly being able to sit down!) Ollie Wilkinson showed again why he is a force to be reckoned with in the briney with a storming 3-hour swim over to Brixham n' back. No doubt this swim will be sold out in minutes after release next year and it is a 'must-have' badge of honour for any Channel aspirant. 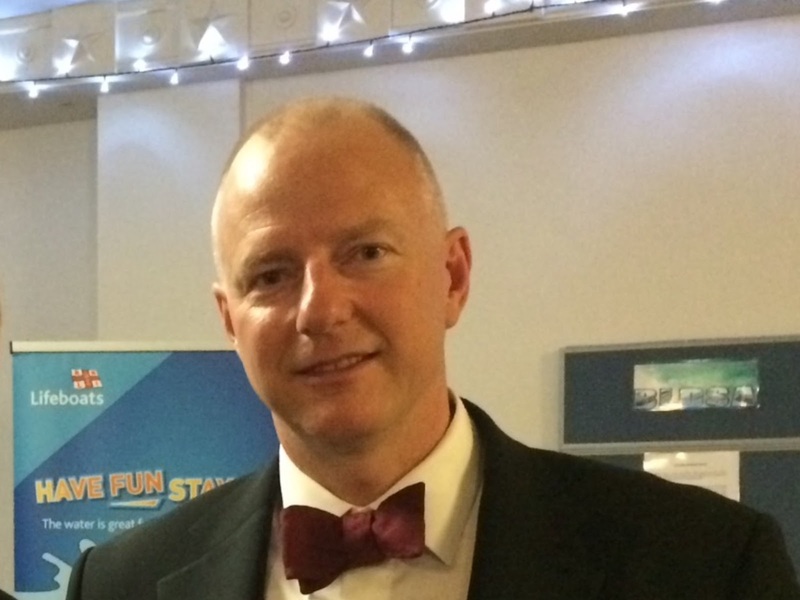 Andre's enthusiasm is infectious and his experience in swimming & organisational skills boast that of someone far older than his years suggest. 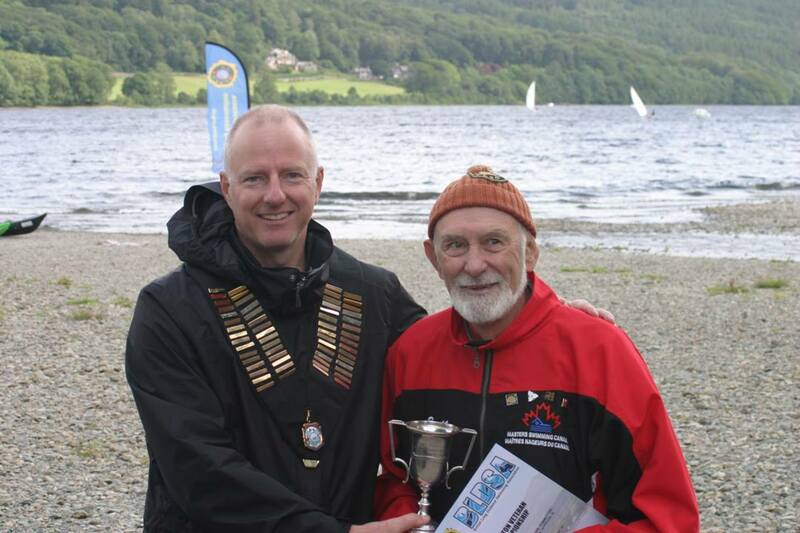 The Bala weekend this year was run by President-elect Philip Yorke (aka 'Yorkie') who is everyone's friend. Again, great weather was enjoyed by ca. 81 swimmers during the course of the 3km, 1km, 6- mile and 3-mile events. 17c water was more than comfortable for most, and we were treated to young Ellie Knight walking away with a new record in the 1-Way 3 mile breaststroke. You have never seen a 15-year-old more comfortable in the water without a wetsuit than Ellie. Without fanfare or bravado, she just 'gets on with it', leaving many experienced front-crawlers in her wake. Yorkie went on to become only the 2nd person in history to swim the Catalina Channel in California on breaststroke during the summer, breaking the previous record by over 7 minutes. Many congratulations from us all mate and good luck in your year as President in 2018! 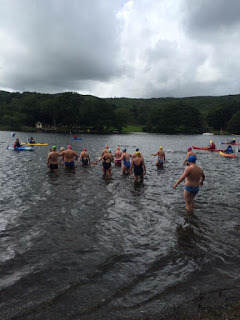 The Coniston weekend saw both the Veterans (on the Saturday) and Seniors (on the Sunday) take to the water. 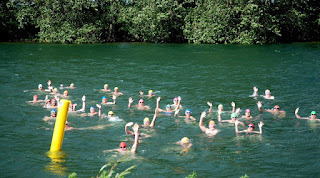 35-odd swimmers took part during the weekend. It was a pleasure to be Race Control on both days for Swim Sec. Patrick Smith, who appeared chuffed to get both swims off the ground, especially after all his hard work for the Colwick Park event was snookered by blue-green algae earlier in the season. It was an absolute treat & honour to meet (and re-clothe (!) a cold) 74 year old Bryan Finlay who is one of the BLDSA all-time greats, joining us all the way from Canada. His stories, energy and 'joie de vivre' are exemplrary; he had Karen Throsby, Stephanie Voss and yours truly mesmerised with his tales of the glory days & sensible views on the state-of-play of the world. The Sunday Seniors event proved to be the more blustery of the two days. Most memorable was witnessing an incredibly brave 13-year-old Isobel Kelly, who came an impressive 3rd in the overall race despite having already swum across the bay before the start, shivering for 10 mins before the swim even got underway (faced with the same situation most of us would have had our first DNS!). That was one of the bravest things seen during the season; unsurprisingly, she walked away with the Perseverance Trophy presented by aforementioned Bryan. Priceless. I walked thru the door at 1/4 past midnight back in Sevenoaks smiling from ear-to-ear re-living this achievement trying to forget about the 5.49am train a few hours later taking me back to work on that Monday. Barbara Harding from the Warrington Dolphins then invited the President to be referee for the annual Albert Dock swim with the added bonus of joining the Dolphins for a 90 mins workout the night before at a local pool. I enjoyed learning what a Hungarian Rep session looks like as I led the second lane, chasing down Michela Richard in the fast lane. One of the best (if not THE BEST) pool workouts of the year. Thank you Barbara & co. 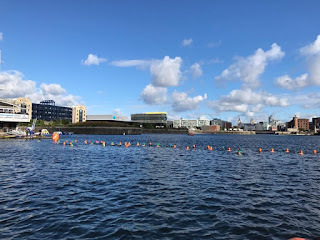 The Albert Dock swim itself is open-to-all and superbly organised by Barbara and her group of enthusiastic Warrington Dolphin volunteers. If you are based in that area and are not a member of that club, then you are seriously missing out, as I am envious of the vibe they have. It was a treat to get to know Barbara who does a fabulous job volunteering in the sport and having a few hours along with Andy Wright on the safety boat was ace. Must admit, I was itching to get into the crystal clear water the whole race - definitely one for the bucket list next year. 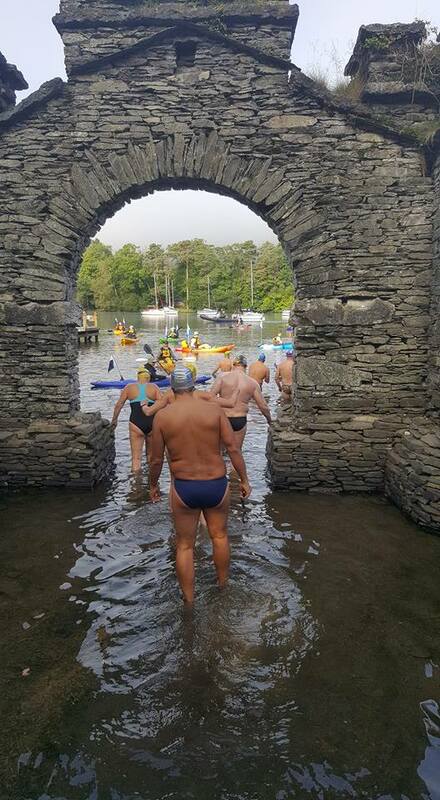 The weather gods smiled again with Two-Way Windermere this year being the longest and most challenging event of the BLDSA calendar. Being Swim Secretary for 2WW presented challenges due to not only organisational workload but also residing a mere 312 miles from the venue! Thankfully, 20 (YES, TWENTY) volunteers put their hands up to spend a weekend sans-sleep to help, including the entire 'Class of 2015' swimmers. Thank you all! En-route to the swim a detour was taken on the Friday to pay respects to a hero (who I never met) and first person to swim Loch Lomond, Gerry Forsberg. Anyone can make that pilgrimage to Morecambe. It is an amazingly uplifting experience and one that has been done by past presidents too I see. 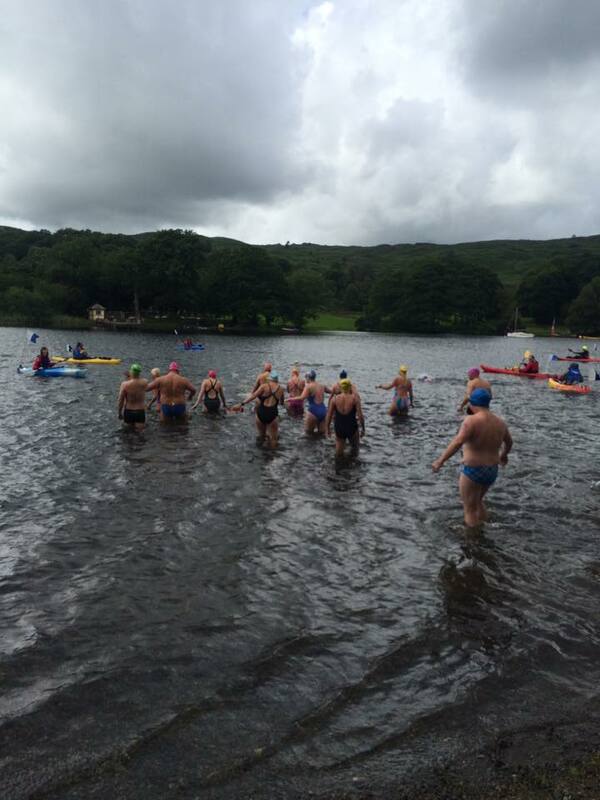 10 swimmers managed to get to the start line with their crews, with 50% completing. Rebecca Lewis again smashed her own course record by ca. 8 mins with most spectators wondering how her Dad, Roger, managed to keep up with her. She set off over 2 hours after the initial wave of swimmers and finished before the whole lot while it was still dark!! Adrian Rotchell won the men's race in a very credible 12 hours 18 mins. Clare Watkins, Mark Yare and Stephen Maloney also completed the swim, proving that preparation is key to completion. This swim is arguably tougher than the English Channel as it does NOT afford the sun on one's back and far less bouyancy! All finishers should gain huge confidence as they must have learnt a great deal about themselves and their crews. One has to question whether swimmers want their family there at the finish as it is such an extreme event and you may be feeling a bit queazy at the end! I hope that those who were unable to finish return in 2 years time or even have a crack at Loch Lomond next year in the interim. This was my last time organising the race as I am standing down as 2WW secretary this year. It would suit someone who lives closer to the venue but happy to run through details thereof to the next Race Director who comes forward. The Ullswater & Derwentwater weekend was a game of two halves, with a very wet and windy Ullswater prove to be no 'gimmie' in unlocking her secrets. Amazingly, we had only one retirement despite some reasonably tasty 13c-ish temperatures. Observe Patrick below regain his swimming mojo after his kayaker capsized near the finish line trying to shelter Patrick from a submerged jetty! Richard Davidson ran the swim again this year but next year hands over the reins to Francis Zielinski. We thank you very much for your contribution to the Association, Richard. Derwentwater was baked in very welcome sunshine as both 5.25 mile and 2 mile events were started. The finish line had to be moved slightly mid-race to accommodate a slightly irritated private boat hire manager (armed with a rather large adjustable spanner!). Annie Stafford and husband Simon did a great job of keeping everyone in order again this year, and it remains one of the most stunning locations in England. Georgia Amison led the longer event from start-to-finish ably supported by Patrick Smith again volunteering his services for the cause. With the following weekend responsibility-free, the President took the opportunity to fly out the Shezza clan to Geneva for 10 well-earned sunny days in an AirBnB on the French banks of Lac Leman which (just so happened to) coincide with the inaugural 12km border-busting swim from Lausanne in Switzerland to Evian in France. A swim where one needs the passport in the feeds bag! This is organised by Tim Davies, Charlie Masding and Ben Barham of the LGSA (who are good friends of the BLDSA) and I expect this swim to sell out fast in 2018, especially as I didn't have to sort my own kayaker - they laid those on for everyone! It was a particularly rugged affair enduring 29c air and 21c water but the pic below showed that one just about coped. Proper open-water swim heaven indeed. It was particularly pleasant being in the same water without the pressure of executing a 43-miler but still a champagne finish. My feed-bag included a bottle of Evian of course! Dee Llewellyn kindly did much of the behind-the-scenes work ably assisted by marathon-swim-legend Caroline Lewis ahead of One-Way Windermere. Chris Malpass did a superb job of marshalling the troops and leading the swim on the day and thus the President managed to have a dip (and boasting a hour PB finishing in 5 hours 36 with Mike Roberts on the paddle again). It was a real treat chatting to Chris at the finish line and hear him enthuse about enjoying watching front crawl as an art form. Chris is one of the real speedsters in the sport and it must have been gutting for him not having a crack at the record attempt on the day itself as conditions were conducive to fast times. Fell Foot cafe hosted the dinner again & we shouted out Wendy Figures on a very fine 1WW swim only 3 weeks after her successful English Channel swim. Frances Zeilinski was also celebrated for being one of the few people in history to complete Windermere on both crawl and breastroke. Well done, both! Overall winner on the day, Rebecca Hollingsworth (who had also joined us for Torbay) headed home to New Zealand having experienced some of the finest weather at swim events Britain has to offer. We are an international bunch now and the world seems smaller somehow! The President was particularly honoured to present the 2nd man home, Ray Gibbs, with his trophy after all the patience he had with yours truly sorting out his terrible stroke in 2011 & 2012. Ray's coaching and understanding of swimming has resulted in 100s of us swimmers achieving goals that before would have been completely out of reach. Thanks Ray. The following weekend, after flying into Edinburgh and hiring a car, I drove round the corner into the borders area (between Selkirk and Moffat) and was absolutely blown away again by the beauty of this little talked about place. I even managed to spot 2 young buzzards sitting on their fenceposts. It's uniquely stunning and has to be a pilgrimage for all marathon swimmers as it is a 'proper workout'. Janet Wilson offered 1km, 3.25 mile and 6.5 mile events with the great Liane Llewellyn-Hickling showing how it is done winning the overall event in water that was recorded at 12.7c. It appears there is life in the old dog yet with the President posting a PB by ca. 20 mins for the 6.5 miles @ 3hrs 12mins, chasing down Adrian Rotchell who again won the men's inside 3 hours. Helen Brindle deserves a special warm mention as she completed the full event, refusing to be beaten and enduring the water longer than everyone else - almost 5 hours! Quite some achievement and you obviously have come a long way on your swim journey, Helen. 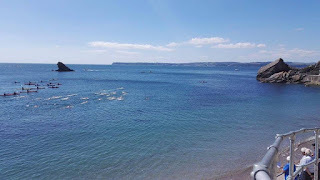 The personal highlight of the weekend was watching 2 local swimmers (Susan Angus and Maggie Brown) enter the 1km novice race with their wetsuits, complete the event, then jump back in without artificial insulation to enjoy the water on their skin for another 10 mins under the watchful gaze of the safety boats. Priceless. It brought back personal memories from 2010 doing precisely the same thing - my wetsuit has been gathering dust in the wardrobe ever since! For 13 years, Stephen Smith has been expertly running the season finale swim at Lynn Regis. 30-odd swimmers took part in either the novice 1.5km event or, the more challenging 4.5km event. 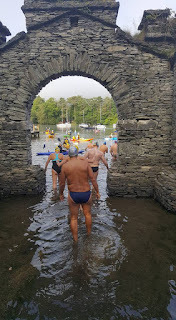 Despite rain being on the forecast, water was above seasonal norms at 16c (although some swimmers begged to differ) with only one retirement on the day, Peter Ingham. Special mention must go to David Randall who took the 'bull by the horns' and blew the field away to take 1st place overall. Dave is in his 60s and puts us all to shame by training daily and refusing to acknowledge that there is an ageing process. It was a treat also to present Janet Wilson with the last person home and oldest swimmer trophies - again another swimmer who sets herself goals and achieves them without fanfare! Stephen has now 'hung up his trunks' as Swim Sec after finishing this year's 1.5km swim and therefore we are looking for a Swim Secretary to run this amazing event. 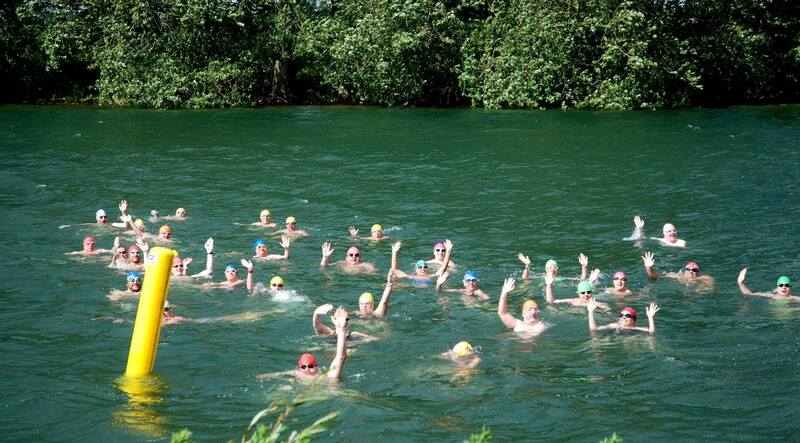 If you live in Cambridgeshire, Essex, Suffolk or Norfolk, I couldn't think of a more wonderful swim to run as a way of giving back to the sport we all love. One such person is Karen Throsby. She had the goal in 2017 to swim 43-mile Lake Geneva but during training got hampered by a wrist injury. To say that must have been gutting is an understatement after ALSO getting injured a day before the starting line the year before in 2016. Refusing to feel sorry for herself, Karen often made the ca. 4 hour round-trip journey to BLDSA swims in the lakes and to Colwick Park to support swimmers in her kayak so that THEY could achieve THEIR goals. You have never seen anyone rejoice more in the accomplishments of others than Karen. She is just one example of many selfless people who generously give up their time to help others in the sport. 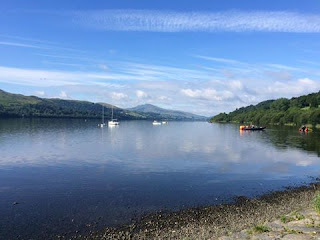 If you are one of the people who has benefitted from swimming and want to see what it looks like from the other side then why not kayak or crew on a longer swim? Another person to highlight at this juncture is Zoe Sadler, who has completely transformed the role of BLDSA recorder in the ca. 2 years that she has been running it. She is on the BLDSA 'front line', every day helping swimmers get individual swims recognised. She has also managed to get the Grand Prix in order. She has hardly swum herself this year, save only the 1.5km at Lynn Regis, so that swimmers again can have their swims accredited properly. It goes without saying that Zoe has been managing literally HUNDREDS OF E-MAILS throughout the year; she has turned these around RAPIDLY and without complaint to ensure the smooth running of the recorder role & the broader Association. That is, of course, on top of her full-time job in a high-powered industry and key role as Mum of two teenage kids with one finishing GCSEs. Often the role of Recorder is utterly thankless, go OUT OF YOUR WAY to praise ZOE and MAKE HER LIFE EASY. Vince Classen is another linchpin of the Association. He processes all our memberships which often results in a particularly busy January as swims fill up quickly and immediate solutions to computer/systems glitches are sought. Sue Coates again spent another year on the 'touchline' often armed with a stop watch which enabled swim secretaries to get on and manage their swims safe in the knowledge that records would be taken properly, standing up to any scrutiny. She only missed 2 swims as an official this year (both Windermere's) and is therefore a rock star of the highest order giving up almost each weekend voluntarily but doesn't even swim! This remains a sport where swimmers set themselves (in many cases) very daunting goals then realise them. The confidence that then brings is meteoric. Some swims are thoroughly enjoyable for swimmers from start to finish (I hit some proper 'zen' moments myself for most of 1WW!) but in some cases conditions dictate that it's more of the 'Type 2 fun' variety where one enjoys it perhaps more after the event (!) Either way, the BLDSA is a perfect avenue for anyone to learn something about themselves (and others). As President, I really enjoyed watching the most inexperienced or youngest swimmers beam with pride of achievement for what was very often only a short swim in relative terms. I also observed how some of the older volunteers lead by example and don't blow their own trumpet. They often get little or no recognition, but without them, the BLDSA wouldn't be where it is today. They have achieved an incredible amount in their lives but they'll only tell you about themselves IF YOU ASK. I put Pat Llewellyn, Janet Wilson and Jean Wilkin-Oxley firmly in this category and wholeheartedly admire the way they all lead by example. It is worth reminding everyone that the BLDSA is run purely by volunteers. No-one takes a single penny of salary or wage from this organisation. It remains my sincere wish that the Association exists for not only my children but my children's children so that they can benefit from it the way we all have. If you share this aim, then do ALL YOU CAN to put your hand up to help in whatever capacity that may be so that we all IMPROVE THE LEGACY. The Association is always looking for Swim Secretaries, kayakers, boat crews, officials (you name it!). If we all just gave an extra 10% of effort (not leaving it to the next man) then the paying it forward mantra continues to be powerful. Let me also spare a few moments thought, however, for the boat crews. ALWAYS the first to turn up to swims and ALWAYS the last off the water often 2-3 hours after swimmers had departed. Nothing was ever too much bother. The BLDSA is a complex animal and it's not just a question of taking an admin fee for a channel swim but the reality is in order to run our events successfully and safely, it involves towing boats from Yorkshire to Dover to Torbay, Wales and Scotland (and many other places in-between) to ca. 14 events with often 7 hour drives in horrendous conditions not to mention the many days taken off work voluntarily. Everyone's time is valuable and THAT IS THE REALITY. Fixing axles or replacing trailers WITHOUT A HINT OF COMPLAINT. Thank you to ALL who helped on the boats this year. WE SALUTE YOU and are indebted to you. Finally, I would like to thank my wife, Emily, and girls, Sophia and Isabelle, for again having to make do with an 'absentee Dad' for much of the summer. Without their support I wouldn't have the platform to just crack on and enjoy the sport that I so very much love. They have been nothing but encouraging all season (ably assisting in Dover too!) but we acknowledge that we are fortunate that this sport has drawn us to places as a family that without the BLDSA and marathon swimming we simply would never have uncovered. Good luck for the rest of 2017 and look forward to seeing you all at the BLDSA dinner in Cambridge in March which is open to ALL (both members and non-members). 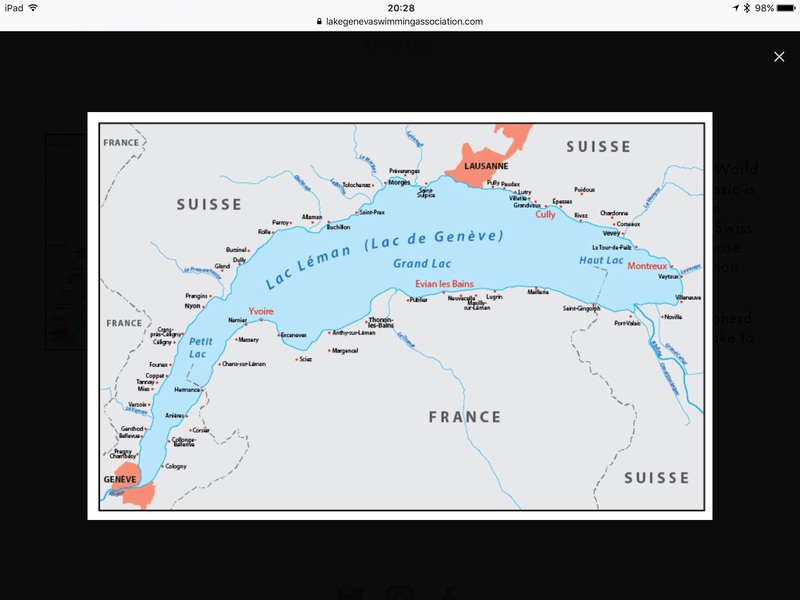 So the LGSA (Lake Geneva Swimming Association (https://www.lakegenevaswimmingassociation.com/) has opened up the old 'Classic 12km' swim route which offers swimmers the chance of swimming from Lausanne in Switzerland to Evian in France. A(nother) border buster swim! Liked the sound of that hence applied for the inaugural swim last Saturday 26th August 2017. Having completed the full length of Lac Leman/Lake Geneva in ca. 33 hours in July 2016 I really fancied the idea of coming back with the family without the pressure of a 43 miler during a 10 day vacation. We stayed in Nernier in France which I think is the most stunning village on the lake but that is another story altogether for another time. Stunning crystal clear blue ca. 21c water, air temperatures in the high 80s and hardly a breath of wind. This has to be as close to open water swim heaven as one can get. Usually when I swim in warmish water in the UK I get bitten by duck fleas - NOT so here! I really love the idea of a cross border swim (ensuring to take one's passport in the feed bag!) and the LGSA laid on the kayaker (I had 'Chris' from North Devon who was absolutely first class). I have seen the title 'border-buster' used in another swim in the US and this is applicable here. What was the swim like? Got in and the water felt warm, pure and absolutely divine. Silky smooth like nowhere else on the planet. There was almost no chop in the lake but the odd bit of swell (probably from the odd ferry that is the life blood of this lake). If you stopped to feed (I did 4 times) it was one of the quietest moments of your entire life surrounded by massive mountains. If you are trying to achieve zen in swimming then I think they've cracked it here as most of the ca. 5 hour swim I was in that zone. Tim Davies, Charlie Masding and Ben Barham from the LGSA have put on a great event here and I reckon it'll sell out quickly next year so you can check it as a weekend away or dovetail it in nicely with a family holiday like we did. It's probably more like a 13.5-14km by the time you have finished (and by judging by many of the finishing times) but that's just to warn you to put in enough training. My advice is to look to the side at the stunning mountains & scenery as you'll be finished before you know it and the best views are from that lake. What an amazing and unique experience. Thank you all involved in the LGSA. All picture credits down to Jaimie Monahan and boyfriend Arik.